Your custom sidebar can also be shown on Posts. To change the sidebar settings for Posts, go to Appearance > Customizer > Posts. The sidebar can be shown either below the featured image, or next to it. 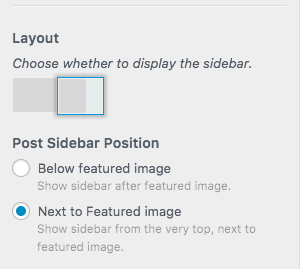 If you choose not to display a sidebar on your posts, the content area will have a larger margin and will be aligned to the center of the viewport. An example of a Post without a Sidebar can be viewed here.